So what do you wear when your husband’s job is on the line and the State of the Union address can be paralleled to an “elevator speech.” If the answer is "something dazzling," then first lady Michelle Obama did just that. 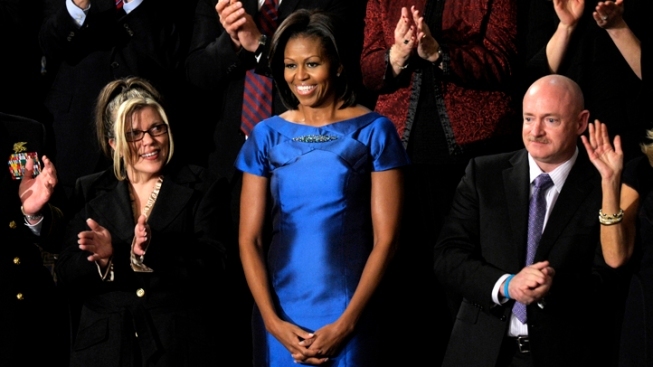 With a round of applause Mrs. Obama entered the House chamber wearing a sapphire blue dress that shined against the usual (dress or pant) suit. The dress was designed by Los Angeles-based Barbara Tfank, who described it as a “criss-cross bodice cap-sleeved slim dress in silk twill,” according to the Hollywood Reporter. Obama has been spotted in Tfank before. At her visit to Buckingham Palace last spring she wore a very feminine, floral-print dress when she met Queen Elizabeth and Duchess of Cambridge Catherine Middleton. Tfank was previously a costume designer. Her collection can be found on Barneys.com.